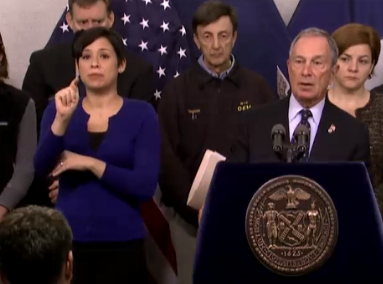 The “sign-language lady’ is Lydia Callis, official ASL interpreter for New York City’s Mayor Bloomberg. Judging from the myriad tweets about her hypnotizing “swag,” she has officially upstaged El Bloombito and become an unlikely star in the wake of this catastrophic storm. She even has a Tumblr fan page! 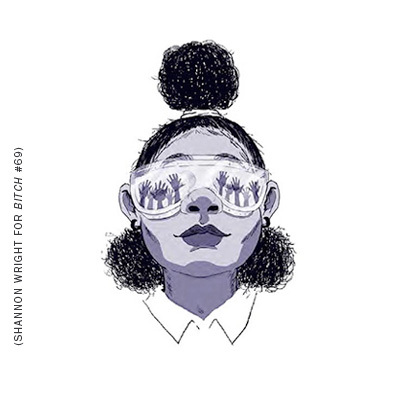 Rapper Jean Grae tweeted that she was going to battle her, The New Yorker’s Sasha Frere-Jones said he was writing her in as a presidential candidate, and about a thousand other people mentioned how “mesmerizing” she is. The overwhelmingly enamored reaction of the public is fascinating and somewhat amusing, but also indicates how little the hearing majority understands about American Sign Language. Many people commenting on Ms. Callis’ interpreting seemed unaware how integral facial expression is to ASL. Just as those of us who hear take cues from tone of voice and inflection, those who are Deaf (and there’s a big distinction between Deaf with a capital ‘D” and “deaf”) take cues from facial expression. Facial expressions are a grammatical aspect of the language and can relay more information than the signs themselves. Many hearing people appeared to mistake her animated signing as being theatrical or over the top, when in reality she’s simply conveying the emotional tone of what’s being discussed. Perhaps it was the juxtaposition of Ms. Callis’ vibrant signing with Bloomberg’s monotone delivery that made her interpreting appear so striking. Or maybe a weary city of millions was looking for any excuse to distract from the mood of impending doom and this particular interpreter was, as so many remarked, “hypnotizing.” Or, maybe the majority of hearing Americans just aren’t that familiar with ASL so watching interpreting in real-time seemed incredibly novel. I’d say it’s a likely combination of all of those things. Regardless of why Ms. Callis has become an overnight celebrity, she’s unintentionally brought ASL into the forefront of American media, highlighting not only the vibrancy of the language, but also the necessity of diverse communication strategies- particularly in emergencies. By all accounts she did an incredibly skillful job and has probably inspired more than a fair share of Google searches for learning basic signs. Also: crushes. To swoon over/watch Ms. Callis in action, check the video below. Hearing, former terp here. Thanks so much for making the point about facial expression. What I see in her signing is the facial emphasis that makes the presentation effective. Thanks — I've tried to summarize this issue in a tweet but now I can steer folks to your article. I think Bloomberg could sell audiotapes for sleep aids. Thanks Jesse! great to hear from an interpreter. I think what the public is responding to here is a remarkably executed, competent job. We like seeing people excel. Lydia Callis simply rocks at what she does. We weren't responding to her novelty, we weren't responding to the facial features. We were responding to her in the way we respond to an incredible athletic feat. Speak for yourself... check the YouTube comments. I agree, she did an amazing job. However, If you read the numerous articles about her (which are now piling up) and the subsequent comments they almost ALL refer to her 'wacky' facial features. Which is probably why she has a page of gifs dedicated to her. That's what I was getting at. Great, only during a weather catastrophe did it take the masses to discover how wonderful ASL is as a language. Now, if only we get those same masses to discover there are a lot of hard-working, talented deaf people out there in need of work. Unfortunately, when those masses find out they're deaf, they quietly (no pun) sweep the resumes under the rug. For an exceptional begin, a remunerating image ought to be chosen. It is plausible to see the images as they seem anyplace on the screen. Kindly note once the image develops 2-5 times, the payline will join the compensating image. Would you be able to visualize how the book of ra connected spielen will join your wages? It's no longer simply speculation once you drop in this amusement. Remember, the reward is legitimately regulated by the image itself. Thus all we can declare is come unite the amusement. I had read an article yesterday about Lydia, and the hearing world's reaction to her, and the Deaf world's reaction to her reaction. But it wasn't until now that I had seen her in action. And I have to say, great terp, but I don't see why people are so amazed/confused/amused/whatever by her facial expressions. I work with a number of Deaf people, and her facial expressions are pretty understated compared to what I see when there's an animated conversation going on in the lunchroom. Hi there everyone, it's my first pay a quick visit at this web site, and paragraph is actually fruitful for me, keep up posting these articles or reviews. My invisible disabilities made me feel undesirable. It took a long time to love myself.